A rare opportunity for the fans of the Maestro to listen to compositions from his second non film album. Nothing But Wind , a live recital of Ilayaraja 's compositions gave a rare opportunity for his fans to listen to his endearing tracks that have delighted them over the last few decades. “For once you have to accept that you’re a great musician” exclaimed music composer Uttam Singh and added that Maestro Ilayaraja is one of the greatest music composers he has ever seen. Though Ilayaraja’s down-to-earth nature restrained him from accepting his greatness, Uttam Singh soon started a friendly-fight with the maestro and said that he had to accept his genius. 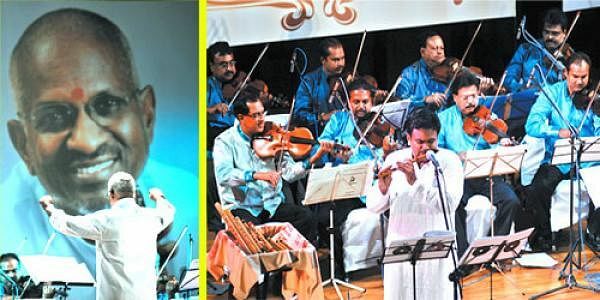 This friendly-fight happened at Nothing But Wind, a live recital of the Maestro, by Prabhakaran, a violinist with Ilayaraja for more than 30 years and flautist Navin Iyer at the Music Academy on Saturday evening. Organised by Ilayaraja’s daughter Bhavatharini, the event gave a rare opportunity for the maestro’s fans to listen to his five tracks 'Singing Self', 'Mozart I Love You', 'Song of Soul', 'Composer’s Breath' and 'Nothing But Wind'. Nothing But Wind is the second non-film album released in 1988. The maestro enjoyed the evening listening to his tracks with his friend Uttam Singh and lyricist Vaali. The evening started off with singer Bhavatharini singing 'Janani Janani Jagam Ne' and was followed by the five tracks from the album Nothing But Wind. Later, praising the music composer, Uttam Singh recalled his association with Ilayaraja and how he had asked him whether flautist Hariprasad Chaurasia could play any notes for his album Nothing But Wind. “It took seven days for Hariprasad to record the music but it could have taken only a few minutes for Ilayaraja to write the notes,” said Uttam Singh. He pointed out that we’re not making use of our own instruments like Pullanguzhal, Nathaswaram and Veenai. Actress Rohini and RJ Bosskey played the perfect hosts for the evening and the audience was mesmerised by the music of the maestro as singers enthralled them with the evergreen melodies of the great musician.